"The twentieth century opens with France, and especially the city of Paris, occupying a preeminent position in the art world...So important does Paris become in the early decades of the twentieth century with regard to the development of avant-garde aesthetics, that it is possible to speak of a School of Paris comprised of artists from many nations who are drawn to the city." One such artist in early 20th century Paris was the French designer and illustrator George Barbier. His imaginative drawings of women in decadent fashion contributed to the sartorial aesthetic of the time, with his prints appearing in French fashion magazines such as Vogue Paris and Gazette du Bon Ton. Barbier produced a large volume of illustrations, primarily of fashion. 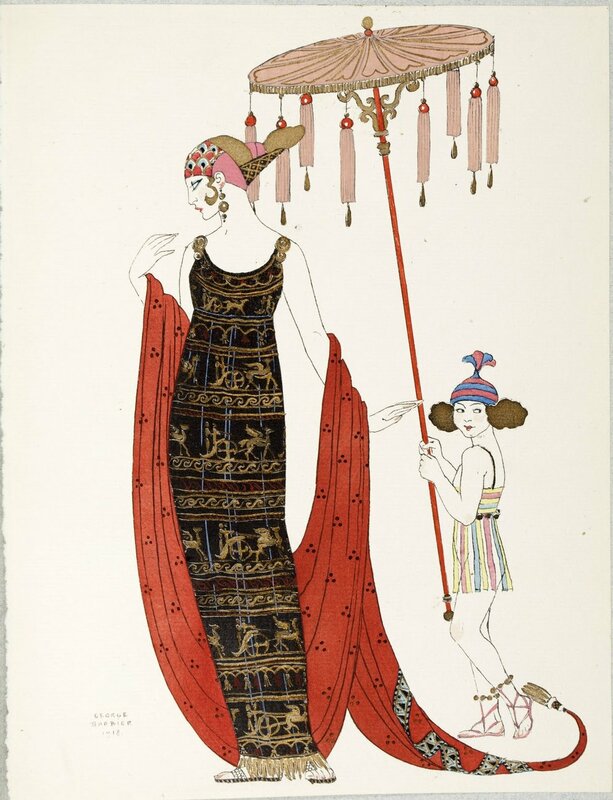 But he also designed costumes for the Ballet Russes, theater, and film, as well as illustrating and designing jewelry and wallpaper (this is literally the stuff I dream about). His fashion illustrations feature strong, modern women unapologetic about their femininity and glamour. "Real" males seldom appear in the artist's oeuvre. When they do, they are usually abject slaves of haughty or indifferent females, or mere props, such as the husband or lover blithely ignored by the gorgeously and provocatively dressed, utterly self-absorbed creature putting the final touches to her maquillage in "Le Grand Décolletage." I don't know if I see these women as utterly self-absorbed, but the point is, they're not apologizing for enjoying what they're wearing, and, really, why should they? That these prints are almost a hundred years old makes me feel Barbier was much ahead of his time in the way he viewed women, clothes, and the relationship between women and their clothes. In a few short years, Chanel would arrive on the scene in Paris with radical clothing designed to unfetter and empower women. I can't help but feel Barbier played a role in the arc from corsets to Chanel by celebrating the idea that enjoying getting dressed and indulging in one's femininity doesn't minimize a woman's inherent power. Morris, R. C. (2008, November 14). Forgotten art of French illustrator George Barbier is rediscovered at Fortuny Museum show. New York Times.